Achieve Natural Energy without Caffeine! After getting my son, Braxton up in the morning and ready for school on time, I admit it, I am ready to go back to bed! Many days, I find that I need some extra energy to get through my day, but I don't drink coffee or Red Bull or any kind of energy drinks. I am actually kind of scared of those energy drinks because I threw up the first time I tried a Red Bull. I got shaky and sick! I wanted to find a 'pick-me up', but wanted the natural "wake up" feeling, not the jittery kind. 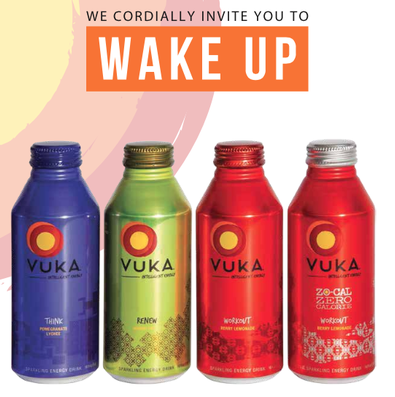 Thankfully, I was introduced to Vuka Natural Energy Drinks that are especially designed for those that want to recharge and "wake up" their body and minds the natural way rather than a chemical concoction. Meet the Founders of Vuka Natural Energy Drinks--Darian and Alexia Bregman, (Vuka.com ; headquarters inSan Diego, CA), who grew up in South Africa, hence the origin of the name Vuka: "wake up" in Zulu. When they started learning about the energy drink market, they had a kind of "wake up" call noticing all the chemicals, preservatives and harmful aspects in the energy drink sector. So they decided to create a range of energy drinks that cater to different occasions, filled with nutrients and vitamins to help you get the right kind of energy for those events. They made Vuka with natural ingredients, no preservatives, and flavors that taste like the real drinks they are, not some kind of unnatural chemical concoction. They are know listed as #14 among all the natural energy drinks in the world, which is a huge deal for a small company of only 6 employees. 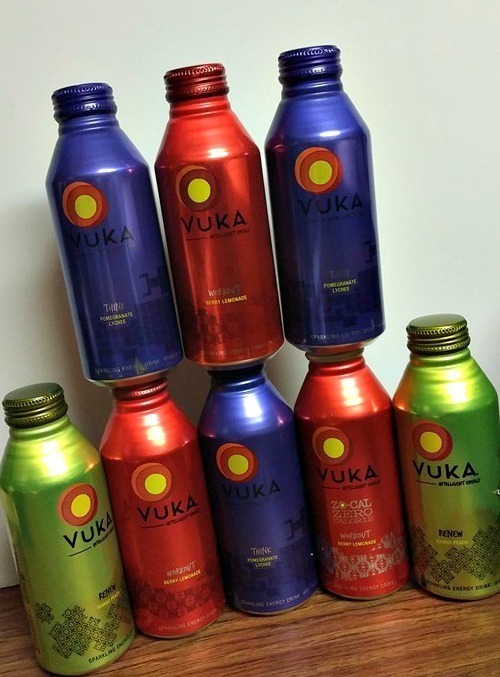 Vuka Natural Energy Drinks has four flavors to chose from including: Workout (Berry Lemonade), Workout Zero (Berry Lemondade; zero calorie), Think (Pomegranate Lychee) and Renew (Mango Peach)--you can find all the flavors and ingredients by clicking here. I received samples of Vuka Natural Energy Drinks to review. First off, the bottles are so pretty! I love the colors. I love each flavor, too. All of the flavors are excellent, but I think my favorite flavor is the Mango Peach. I drink one usually right after I take Braxton to school, and then I sit down and look through my morning emails. The very first time I drank a Vuka energy drink, I was so full of energy that I started cleaning the house instead of my usual routine of checking my inbox. Wow! This is certainly something I could get used to. I had no shaking or jitters like I get with caffeine. My energy level stayed pretty high throughout the day and I did not experience a burn out the way I have with other energy drinks. I will definitely be keeping Vuka on hand for before my workouts this winter. I think Vuka would be an amazing holiday gift or stocking stuffer for the person on your list who enjoys natural products as well as fitness. Vuka can be found at regional Whole Foods and Sprouts (to name a few retails stores-you can find more stores here; Vuka is sold for under $3) and can be bought online at Vuka.com.